The main objectives of this report is to discuss the status, potential and constraints of e-Business. All this activities are done by Information Technology which are used in International Business at the present time. The paper also list specific policy changes aimed at bringing improvement to the legal and regulatory environment affecting e-commerce. In general sense information technology based business facilitates the very process of international transaction. Information Technology is a terminology which is known to all educated people of the World at present times. Information technology (IT), as defined by the Information Technology Association of America (ITAA), is “the study, design, development, implementation, support or management of computer-based information systems, particularly software applications and computer hardware.” IT deals with the use of electronic computers and computer software to convert, store, protect, process, transmit, and securely retrieve information. When computer and communications technologies are combined, the result is information technology, or “InfoTech”. Information technology is a general term that describes any technology that helps to produce, manipulate, store, communicate, and/or disseminate information. Presumably, when speaking of Information Technology (IT) as a whole, it is noted that the use of computers and information are associated. Globalization has brought in many changes in the business scenario with the whole world inching towards one big market place. Communication between the buyers and sellers has become critical as each can opt to explore a greater number of alternatives than ever before. E-commerce through Internet, e-mails, websites, and other facilities, enables a businessman to be linked with every corner of the world, and thus opens up greater opportunities in the world market. Another important factor is the time required for completing a business transaction. As markets are becoming competitive and information is more readily available, a quick, reliable and replicable transaction implies availing of prevailing opportunities. On the contrary, delays in processing a transaction might become synonymous to wasting an opportunity. Therefore, a fast and alternative mechanism of communication, contract, and payment is an integral part of a globally competitive business organization. The information technology based business facilitates the very process of international transaction; this involve securing and finalizing a contract, delivery of the product, and finally payment for performance of the contract. The movement of goods and services, as well as the payment mechanisms within a country and more so outside a country, are governed by regulatory and legal issues. Hence, the regulatory environment is at the core of e-Business development. This paper aims to highlight the status, statutes, potential and constraints of e-Business. Both the statutory laws as well as the challenges in implementing them will be attempted. The paper shall also list specific policy changes aimed at bringing improvement to the legal and regulatory environment affecting e-commerce. The topic is mainly descriptive, maximum information is collected from secondary data and rest of the information is collected through personal interviews. Analysis of secondary data helps define the constraints of e-business and develop an approach to the problem. The following chapter-2 of this paper, presents an overview of the e-commerce. It discusses the various links and ways of communication used in e-Business. 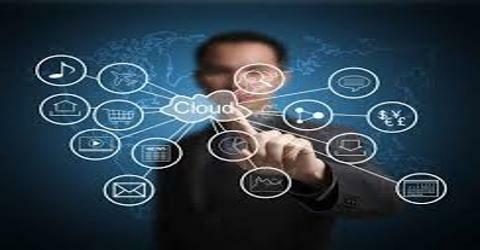 It is, therefore, strategically poised to be the front-runner in e-Business applications as well. Chapter-3 provides an overview of the regulatory and legal issues related to e-Business and telecommunication as well as presenting a brief review on their effects. The finance and banking aspect of e-Business is also discussed in this section. It also reviews the major regulatory acts affecting e-Business, the macro trade policy regime, negotiable instruments and IPR (Intellectual Property Rights). Major conclusions on issues relating to legal and institutional constraints are summarized in the concluding section. The term “e- Business” has a very board application. It can describe companies operating in the ICT producing sectors as well as new emerging sectors and industries such as in the area of digital content. However, at a more fundamental level, the term e-Business also describes the application of information and communication technologies to business processes in all sectors of the economy to reduce costs, to improve customer value and to find new markets for products and services. Internet Retailing or ‘e-Tailing’ as is usually referred to as covers retailing using a variety of different technologies or media. It may be broadly be a combination of two elements. Combining new technologies with elements of traditional stores and direct mail models. Using new technologies to replace elements of store or direct mail retail. B2C: Business to Consumer communication is the one type of e-Business communication where selling takes place to members of the public. This enables consumers log onto the Internet to buy and enjoy a product, and allows business of all sizes to reach consumers all over the world. It encompasses Internet commerce, Interactive TV, Electronic Mail Order and Phone Sales etc. B2B : Business to Business communication is the electronic transaction between the manufacturer and its intermediaries come under to B2B e- commerce communication. It is usually suggested that there is some form of negotiated relationship between supplier and company and it is mainly used for corporate procurement. Trading information and communication between parties is being exchanged electronically using agreed upon protocols implemented through specific commerce solutions put in place to facilitate this interchange. It comprises transactions tendering on Internet, Intranet, Extranet or EDI etc. Yet, the B2B application already exists in the export sector of Bangladesh, especially in the Ready Made Garments (RMG) industry. C2B : Consumer to Business is the another type of e-commerce which allows prospective organization, manufacturer and even service center to visit their website and offers to buy on hand products at the requested price. When the organization accepts their offer, the consumer is then obligated to sell that product to that organization. www. price line is the good example of this type of e-commerce communication. B2G : Business to Government communication is a new type of communication, which involves electronic transaction between government and business organization. It contains public `tenders, trade procedures e.g. customers etc. C2C : Without any involvement of business and middleman `Consumer to Consumer’ e-commerce takes place as the last type of e-commerce communication on the internet. When receiving announcement of selling a particular product from any consumer through consumer exchange website, one can acquire that product by biding against each offer for their own interest of the both parties. 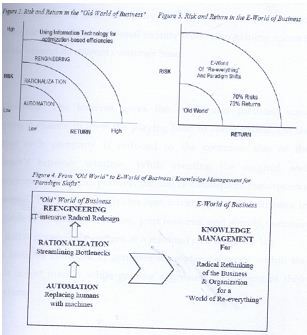 Graphical Representation Of Risk And Return In The World Of Business. Source : Yogesh Malhotra, Florida Atlantic University @ Brint. com LLC Knowledge Management for E- Business Performance : Advancing information Strategy to ‘Internet Time’. Expand market reach : This is one of the major advantages of doing business online. A little company now has the ability to reach markets far beyond its traditional vicinity while also gaining access to markets beyond its current customer base. Visibility: The Internet gives the small and medium sized company a chance to level the playing field to some extent. On the Internet each company is reduced to the common size of the customer’s browser window. While creating the original web presence may not be inexpensive, the cost of subsequent maintenance is minimal. The Internet provides cost advantages for businesses in being able to update information, post features, and simply maintain a site that is perennially current at a minimal cost and time lag. These features combine to generate a greater presence within the present target market while gaining a greater component of their mind share. Enhance responsiveness : One of the greatest benefits of doing business online rests in its ability promote relationship building with its customers and partners. The Internet is unmatched in its ability to increase responsiveness. Examples of this responsiveness are clearly visible in companies such as Dell UPS and FedEx that now allow both partners and consumers to check various facets of their transactions directly by logging onto their web sites. This interconnectedness comes at a lower cost and on demand thus, providing a more efficient method to respond to customer needs/ wants. New services: Introducing new services in traditional markets is difficult and expensive. The Internet provides the option of introducing new services for customers, partners, and employees at a minimal incremental cost. Strengthening business relationships : The ability to enhance business-to–business communications has a huge potential. In the past companies were using EDI electronic data interchange to streamline business processes and enhance communications. Through EDI suppliers, manufacturers, distributors and retailers were able to share information and enhance the flow of information and goods through the supply chain. While the concept of EDI was good implementation was lagged because the technology cost a considerable amount and hence was affordable only for the large organizations that could afford the accompanying infrastructure cost. The www changed all this. Now the benefits of shared information can be enjoyed by organizations of all sizes big or small at a fraction of the cost. Access to real-time data enhances efficiency, which improves productivity and profitability, further the nature and content of information that can be shared has broadened in scope. The multimedia nature and real time capabilities of the Internet are fostering an environment that is conductive for relationship building. Cost Reduction: This feature has been realized and well understood by the organizations of the 21st century. The blossoming and adoption of the Internet has seen businesses realize enormous cost savings by moving a myriad of services online. From customer service centers, to online tracking of packages, to online brokerages the list is endless. The ability to digitize offerings and provide products/ services on demand has lead business to realize two allied goals of enhanced service at a reduced cost of product, support, and service. Global accessibility and sales reach: The online community is on around the world 24 hours a day seven days a week. Businesses now have the opportunity to expand their customer base, and in some instances even their product line. Closer relationships: The Internet is structured to facilitate two-way communications that is ideal for bridging the spatial gap between an organization and its customers. The open standards inherently associated with the Internet translate into interoperability between companies and their web sites. Reduced costs: As mentioned in the discussion earlier businesses have recognized that this new technology can be effectively deployed for the dual purpose of enhancing customer service while lowering costs. Numerous examples of deploying the Web for providing services such as customer service, customer information centers, software download centers, have become mainstream and are here to stay. Tailor made offers and customer loyalty: Today’s software developments give businesses the ability to customize the entire web site for each single user with no incremental costs. Mass-customizations allow the marketer the ability to create web pages, products, and services that suit the requirements of the user. A customized web encounter does not end with a preferred page layout, but on the other hand extends to a pre-selection of goods and services. Convenience: Online buying is convenient. The consumer has access to an endless array of product and services all from the convenience of home. Costs : Cost comparisons are easily done on the WWW. This process had been further improved with the deployment of programs called bots. These are electronic shopping agents or robots that comb Wed sites, to compare prices and product service features. Factor in search costs and the consumer now has the ability to minimize both the search cost and monetary cost of the product without ever leaving home. Choice : As mentioned above the array of products and services that are offered on the WWW is enormous and growing each day. Customization : This has been a major coup for online marketers. Visit a company such as (http:// www. bluefly. com) and you now have the ability to customize your shopping experience. Merchants now allow consumers to define their entire shopping experience. Bluedfly a clothes retailer on the WWW allows visitors to customize an individualized catalogue, which is updated each time a customer log on. Customers specify product categories of interest and hence are exposed to only those only products that interest them. Communication (Interactive): With the growing diffusion of a wider bandwidth this promise of the Web is finally being realized. It is currently possible to engage in an electronic dialogue with a Web merchant and as bandwidth is enhanced the capabilities will be enhanced to include audio and video formats. Some merchants such as Landsend. com have already incorporated these features into their Web strategy. While most organizations worldwide are largely focused on the development and implementation of electronic commerce solutions especially static, point-to-point relationship many companies, particularly in Japan and Europe are beginning to capitalize on the new potential for accessing the consumer through wireless or mobile networks. This trend is starting to emerge in the United States as well. M-Commerce has been growing rapidly in recent months and is expected to soon overtake many of the now more traditional electronic routes to market. A few numbers explain why: While Gartner estimates that more than 180 million PCs will be sold worldwide in 2001, 13 there are already close to 400 million users of mobile phones, a number estimated to grow to more than one billion worldwide by 2005. High mobile phone penetration rates-as well as the proliferation of personal digital assistants (PDAs) and pagers suggest that many new e-Business customers will be mobile-only from the onset. The low cost of handsets compared with PCs will maintain that balance for some time. In countries such as Italy, for example, where PC ownership is low and mobile ownership high wireless, technology is likely to become, and remain, the dominant route to market. The same is true in less-industrialized countries -including China India and Indonesia-where wireless technology is more cost effective to implement than traditional wire line telecoms. Much of m-commerce technology is in the trial stage but as new solutions are lunched in the coming months, demand will surge. In their rush to capitalize on this trend many, companies will inevitably scrimp on security and controls or overlook them entirely. A number of security measures are built into m-technology, but as experience shows, all technology can be defeated. As organizations consider how they might implement m-commerce, they must also consider how to optimize the risks they face in this evolving environment . M-Commerce encompasses three main areas: Wireless Application Protocol (WAP), which allows Web-style information to be downloaded to mobile devices; General Packet Radio Services (GPRS), which allow high-speed downloads of mobile data; and Bluetooth TM, a low-range radio technology (developed by a consortium including Nokia) which enables applications to communicate automatically. Just as in the “e” arena, m-commerce B2B relationships hold the greatest promise for efficiencies and revenues. Japan and Europe are leading the development of m-commerce technology, likely as a result of their both having adopted standard platforms for mobile communications. M-Commerce activities are growing most rapidly in the Scandinavian markets, where mobile telephone penetration is particularly high. An estimated 57 percent of the Finnish populations, for example, subscribe to a cellular telephone supplier. 15 In fact Finland has more mobile phones than fixed land lines. Internet services are presently available in almost all over the world. Its usage for e-commerce by the potential producers to export as well as to access inputs will be dependent on their willingness and ability to use this medium as well as that of the buyers of final products and the sellers of intermediate goods and services. 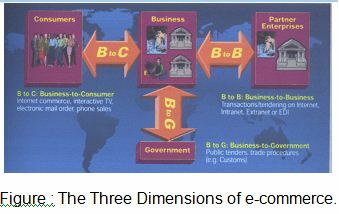 The three dimensions of e-Business are Business- to Consumers (B2C) Business – to Business (B2B) and Business to Government (B2G). Transactions involving information collection obtaining various governmental forms registering activities can also be conducted online. This will reduce time, costs, corruption and the necessity of going through lengthy bureaucratic procedures as well as increasing transparency. Figure depicts the three dimensions of e-commerce. Business to Consumers (B2C) e-commerce is practically non-existent within Bangladesh, while a very limited level of Business to Business (B2B) and Business to Government (B2G) transactions exists. The potential for use of e-commerce by Bangladeshi consumers and businesses with foreign firms is much brighter and can play an important role in boosting the country’s exports. A significant volume of B2G is also possible, as the government remains the biggest spender. Electronic commerce generates competition, revenue and profit. It also creates flows of goods and services and hence traffic. Subsequently, it can act as an incentive for investors to finance locally available infrastructures, connectivity and bandwidth. However, before this `virtuous circle’ can be initiated, the `magic triangle’—access, trust and know-how-an essential precondition for the start-up and expansion of electronic commerce, must be firmly established between both the public and the private partners involved. This magic triangle can only be set in place if it receives the full and active support from the various stakeholders. Access to e-technology such as the Internet is a necessary but not a sufficient condition for the development and growth of e-commerce. The popularity of e-commerce in any economy will be dependent not only on the cost, efficiency and reliability of Internet technology but also on the supportive framework that includes legal and financial infrastructural support as well as support in the form of technical expertise (know-how). A weak and inefficient supportive environment can damage the trust among partners and will stranglehold the possibilities and attractiveness of using technology for business and commerce. Internet services are directly dependent on the telecommunication infrastructure of the country. The Bangladeshi telecommunication sector is characterized by poor level of penetration, high cost to access and a lengthy waiting period. Although the Bangladesh Telegraph and Telephone Board (BTTB) continues to be a monopoly in providing basic telephone connections, the private sector’s involvement in cellular phones and as Internet Service Providers (ISP) have been allowed. Despite the need for easy and affordable access to Internet services, BTTB’s pricing and regulatory strategy on ISPs are restrictive. BTTB’s decision to itself offer Internet services since 1999 has caused concerns among private providers as they are exempted from paying fees and royalties to the government. BTTB’s monopoly over long distance and international voice traffic remains protected by the National Telecommunications Policy (NTP -98) until 2000 and 2010 respectively. This has been a consistent impediment for the growth of e-Business. A proven important catalyst in the promotion of e-Business, Voice over Internet Protocol (VoIP) is prohibited in Bangladesh. Demand for VoIP has however, been increasing and the industry has been urging the government to liberalize the international traffic. The NTP -98, enacted in 1998, suggests establishing an independent regulator, the Bangladesh Telecommunications Regulatory Commission (BTRC). However BTRC is yet to be operational. Easy access to credit and a well-developed financing mechanism is essential for Bangladesh to compete in the highly competitive export market. There are three types of export financing in Bangladesh: pre shipment financing in local currency by commercial banks; pre-shipment financing in foreign currency by commercial banks through the Export Development Fund (EDF); and back-to-back letter of credit (L/C) facilities. Studies have reported that lack of access to trade financing, caused by a weak commercial banking system and foreign exchange scarcity, has constrained Bangladesh’s export expansion. The insistence by commercial banks on the use of L/Cs for export financing and the existence of interest rate ceilings on export loans has had negative effects. Indirect exporters are forced to give inter-firm credit for their sales of indirect export items to direct exporter because they do not have to option of sight or advance payments from direct exporters. Restriction on issuance of international credit cards prevails. Lack of internationally accepted credit card facilities sends wrong signals to their foreign counterparts about the inability of Bangladeshi businessmen to make speedy payments through international credit cards. Restrictions on foreign currency remittance imply that many businessmen make foreign payments through the illegal-but extensively used-system of “Hundi”. According to the Evidence Act. (The Negotiable Instrument Act, 1981; Revised up to 1999), a physical signature is necessary to make any contract valid in the eyes of the law. This makes electronic contracts void under Bangladeshi law. The Evidence Law should be revised to recognize the validity of a digital signature. Bangladesh has an intractable problem of poor governance. This has been manifested in the form of continued active involvement of politicians and public officials, often in collusion with the private sector, in adopting unfair business practices. As a consequence, institutions continue to remain weak and legal and regulatory reforms are difficult to implement. Rent seeking activities galore, discouraging competition and promotion of efficiency. Poor governance can be both a cause and indirect effect of ineffective e-Business development. If the cost of doing business remains high, characterized by bottlenecks, bureaucratic red tape and corruption, the efficiency gains from e-Business becomes mute. Trade and commerce through e-Business assumes business norms and practices that are mutually acceptable or understandable between buyers and sellers. Poor governance discourages trade in general and e-Business in particular. The major reasons for poor Foreign Direct Investment (FDI) in Bangladesh are its small domestic market, poor infrastructural facilities, weak governance, and poor law and order conditions. Bureaucratic red tape and corruption also dissuades domestic investment. E-commerce and FDI are likely to reinforce each other’s presence and growth . Acceptance and successful application of e-Business would enhance the business environment, sending signals to foreign investors that it is becoming easier to do business in Bangladesh. This paper highlights various constraints to commerce and trade in general and e-Business in particular. Absence of encryption law that precludes acceptance of digital signature. Strong dependence on Letter of Credit (L/C) to conduct international transactions. Non-issuance of international credit cards for cross border transactions. Interest rate ceiling on export loans. Business to Consumer (B2C) e-commerce is unlikely to be of much use in the foreseeable future in Bangladesh. At the domestic level, low per capita income limited infrastructural facilities (e.g low teledensity), weak legal environment (inadequate contract laws, poor implementation and enforcement), and lack of trust and confidence between business and consumers are going to hinder B2C. In the backdrop of such limitations, the low wage economy with high levels of unemployment and underemployment, will continue to rely on the physical presence of buyers and sellers during a transaction in most cases. B2C for cross border trade is inhibited by the factors suggested for the domestic front. In addition, non-availability of international credit cards foreign currency remittance restrictions delays and informal payments at customs clearance even for small value and quantity items will discourage B2C . As mentioned before, the Business to Business (B2B) Scenario prevails in Bangladesh to a very limited extent. The B2B scenario exists mostly in the export sector, especially in the Ready Made Garments (RMG) industry. RMG has the lion’s share of the export earnings in Bangladesh, accounting for 75 percent of total exports. The current value of annual exports of the RMG sector is close to $4.35 billion. The RMG sector has begun to use Internet, and its dependence on e-commerce is likely to grow significantly in the coming years. E-commerce through the Internet is poised to be an effective business tool for the RMG exporters. The Internet would enable them to seek information about potential buyers as well as raw material suppliers. Similarly the practice of posting a website by individual producers has begun. Opening a website is a step towards the right direction. Also, the adherence of Bangladeshi firms to quality, labor and environmental standards (e.g. ISO9000, QS 9000) can also be shared and highlighted through the Internet technology. Following the withdrawal of the quota system and the GSP in 2005, the RMG sector has inevitably become more competitive. As expected delivery time decreases, considering alternative payment mechanisms becomes imperative. The effective use of e-commerce both for placing orders, purchasing raw materials and for quick and efficient payment would be the necessary ingredients for any country to enhance its ability to deliver early. Necessary infrastructural, legal and regulatory reforms will be essential to avail of the e-commerce technology in dealing with the international market place. Access to the market depends on the buyers and sellers’ willingness and ability to market through mediums that are mutually cost effective, reliable, and replicable. A foreign buyer, say in the readymade garments sector, expresses a preference to use e-commerce for its purchases, thereby circumventing the Letter of Credit (L/C) mechanism to place an order. Since the overseas financial institutions often insist for “ Add Confirmation” it increases the cost of L/C. Add Confirmation is basically a matter of payment guarantee depending on the country’s credit rating, asset status etc., where Bangladesh generally lags behind. If Bangladeshi producers are unable to accommodate electronic transfer of payment and other facets of e-commerce, the business opportunity will move on to countries that have developed such systems. e-Commerce usage will become attractive when entrepreneurs will be convinced that this medium is capable of obtaining orders as well as increasing profitability by eliminating the role of middlemen. However, confidence and trust between the buyers and sellers is an important determinant. If the local producer fails to ensure adequate quality or timely delivery of products, the benefits of an efficient search and communication process wil be undermined. Thus, authentication of both buyer and seller is a prerequisite for successful implementation of this medium. With improvements in infrastructural facilities (e.g. cheaper and better access to Internet service), and greater application of the computer in management and finance by individual firms, export oriented sectors (such as frozen food, sea food, leather) as well as importers would appreciate the ease and benefits of the Internet in promoting their products. The government is a major buyer of goods and services from the private sector. Typically, the government procures goods and services by inviting tenders. This has been the traditional method of any government procurement for goods and services. Tender notices are published in the major national dailies followed by selling the Request for Proposal (RFP) documents to the interested bidders. If any bidder seeks clarification on any aspect of the REP, the customer is mandated to notify that clarification to all bidders by mail. In addition, to costing money and taking time, such notification sometimes forces the customer extending the bid-closing deadline. Bidders also obtain the RFP document “unofficially” for a comprehensive understanding of the `scope of work’ as well as for assessing their own capability. The availability of the RFP and other relevant documents on-line provides an alternate choice, thereby reducing the monopoly rent that can be extracted. In order to prevent such unfair practice, Bangladesh Telegraph and Telephone Board (BTTB) initiated publishing the RFP documents of selected projects in its website. This immediately stopped the illicit practice of unofficially selling the RFP document, and only competent bidders were able to procure the RFP documents. In addition to reducing the extra administrative burden of BTTB, it also enabled BTTB to close those bids within a reasonable timeframe. The posting of the RFP documents on the Web is however an isolated effort being initiated by a few BTTB officials. Introducing on-line payment or allowing electronic fund transfer for selling the RFP would, be a significant leaf towards B2G in Bangladesh. There are numerous instances of deliberate “unavailability” of the RFP, namely while the bids for civil infrastructure projects are invited. Syndicated vested groups for bid the other bidders’ participation by forming a cartel. B2G inherently brings transparency in such cases and ensures a level playing field for all the bidders. Electronic submission of the RFP followed by presenting the hardcopies could also be used to promote transparency, accountability and the threat or coercion that is often evidenced during the bid submission period. In addition, transactions involving information collection, obtaining various governmental forms, registering activities can be conducted on-line. This will reduce time costs, corruption and the necessity of going through lengthy bureaucratic procedures as well as increasing transparency. (Hossain, 2000). The foreign bank are the pioneers in adopting electronic finance in Bangladesh. Most of the foreign banks are using the computerized transaction system and taking advantage of the superior technology by attracting customers and providing interbranch and interbank linkage. Foreign banks through successful use of a global network, has increased the timeliness and accuracy of information, benefiting its customers, its employees and also its management. A broad spectrum of electronic baking services, a subset of e-finance, is available in Bangladesh with various degree of penetration. Credit card and POS services is provided by 23 percent of banks [PCBs and FCBs]. Several thousands of POS terminals have been set in major cities of the country. Telebanking is second most penetrated e-baking service in Bangladesh. ATM is expanding rapidly in major cities. A group of domestic and foreign banks operate shared ATM network, which drastically increase access to this type of electronic banking service. The network will gradually be extended to other parts of the country. Credit card is also becoming very popular service in major cities of Bangladesh. Inadequate Legal Framework. Bangladesh is yet to formulate a specific law for protecting the IT sector. The legal issues like use of computer for criminal activities, cyber crime etc are remaining out of reach. Bangladesh has drafted an ICT Law, which has been approved by the highest authority in February 2005 to facilitate electronic commerce and to encourage growth and development of information technology. In addition, the Copy Right Law 2000 has been amended to include computer software. However these laws are still inadequate to meet a proper legal framework which would ensure the protection of IT sector of Bangladesh both in the country and in the international community. However, recently The parliament of Bangladesh has enacted Information and Communication Technology Act, 2006. Piracy and Copyright. Though the Copy Right Law 2000 has been amended to include computer software but piracy of computer software, use of computer for the piracy of audio and video, composition of books etc are going on in a mammoth form in Bangladesh. All these violate the copyright act. Even there are incidences of producing forged documents like certificates of different Education Boards, mark sheets and many other types of documents which not only pose threats to the IT sector but also to the over all security of Bangladesh. Illiterate Population. Bangladesh is a populous country. Instead of taking the population as a burden, our aim should be to transform this population into power. We have great potential in the IT sector if we can make this population computer educated and put them at the right places to perform their expertise. But unfortunately the majority of our population is illiterate which is posing a threat to expand our computer based education, e governance and automation of different government and public sectors. Low-wages & Poverty. IT professionals in Bangladesh are very less paid in comparison to the international standard. For that reason, many of them get involved in various professions in which they have better opportunity to earn money. Disruption in Submarine Cable. Bangladesh is connected to the submarine cable SEA-ME-WE 4. This cable is sometimes susceptible to break in the sea due to the anchors of vessels. However in recent days there are less incidents of such type. Initially when the submarine cable was laid over the land connecting Cox’s Bazar Landing Station to Chittagong and Dhaka, there were many cases of cutting and stealing the cable. The locals thought that it would have copper strands inside which is of good monetary value. However soon enough their idea changed and now the cutting of cable is in very less in number. However all these incidents were posing threats to the IT sector due to failure of connecting to the internet and many correspondence, data entry etc were affected. Migration of IT Professionals to Foreign Countries. The terminology “Brain Drain” is very much applicable for Bangladesh and especially to the IT sector of Bangladesh. Low wages, inadequate technical facilities, lack of proper job opportunity and lack of research facilities are mainly responsible for this huge loss of Bangladesh. Experts are frequently migrating to foreign countries which suit their purpose. Mischief of computer and computer system. Alteration of source code of computer. Publication of false, indecent and defamatory statement or information in electronic form. False representation and concealment of information. Disclosing electronic signature for cheating. India’s Development in IT Sector over Bangladesh. This is one of the largest threats to the IT sector of Bangladesh. Despite having lot of potential in this sector we are lagging behind and our neighbouring country is in such a situation that they have gone out of reach of any country in this region on this aspect. In order to create the employment possibility, the IT department of India has taken a series of measures. An education council has been formed by drawing people from industry and academia to work out plans and steps required to be taken to bridge the gap of industry requirements and curriculum of the colleges. There are similar nature of initiatives taken by renowned IT companies which not only train the students but also train the faculties of the colleges producing manpower for IT and ITeS industries. The software export sector alone making the economy of India a much stronger one. In the year of 2002-2003 where India exported software earning USD 9545 millions, they have exported USD 50,000 million in 2007-2008 and hope to increase it by more USD 10000 millions in the financial year 2011-2012. at the same sector in 2008-2009 Bangladesh has exported only USD 43 millions worth of software. This paper presents possible e-commerce application availing of the IT technology be the is likely to become a necessity because of international industries is likely to become a necessity rather than a choice. Banks, customs and other supporting institutions, along with the entrepreneurs exporting goods and services will have to accommodate the external demands in order to maintain competitiveness and open new global opportunities. Creating awareness among the exporters/importers regarding e-commerce is essential. They have to be knowledgeable to appreciate and to utilize the benefits of IT. The exporters are not required to acquire operating knowledge on IT. Their understanding on the cost-benefit aspects followed by adopting e-commerce would be an achievement. Business associations can play a major part at this juncture by highlighting the benefits of IT to its members, and encouraging them to use customized software for their day –to-day operation . The overview of the legal and regulatory statutes suggests that the developing countries has made significant progress in facing the challenge of globalization and concurrently embracing e-commerce in due course. Technological and infrastructural constraints to e-commerce can be overcome by revising laws and regulations as necessary. A better understanding of the potential benefits of e-commerce by the policy makers and bureaucrats is essential for speedy implementation and further reforms. Despite being a poor country, selected segments of the Bangladeshi business community has embraced technology with reasonable success. The Facsimile in the 1980’s and mobile telephones in the 1990’s popularized modern technology in the mass market. Personal computers and the Internet are also emerging as day-to-day business tools. These positive indicators are favoring the prospects of e-commerce in Bangladesh.